Basic Theory:Historical Background of Raman Spectroscopy. Energy Units and Molecular Spectra. Vibration of a Diatomic Molecule. 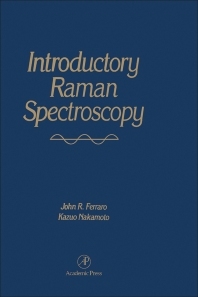 Origin of Raman Spectra. Factors Determining Vibrational Frequencies. Vibrations of Polyatomic Molecules. Selection Rules for Infrared and Raman Spectra. Raman versus Infrared Spectroscopy. Depolarization Ratios. The Concept of Symmetry. Point Symmetry Elements. The Character Table. Classification of Normal Vibrations by Symmetry. Symmetry Selection Rules. Resonance Raman Spectra. Space Group Symmetry. Normal Vibrations in a Crystal. Selection Rules for Solids (Factor Group). Polarized Raman Spectra of Single Crystals. Normal Coordinate Analysis. Band Assignments and Isotopic Shifts. Instrumentation and Experimental Techniques: Major Components. Excitation Sources. Sample Illumination. The Monochromator. Detection. Instrument Calibration. Sampling Techniques. Determination of Depolarization Ratios. Raman Difference Spectroscopy. Special Techniques: Nonlinear Raman Spectroscopy. Time-Resolved (TR2) Spectroscopy. Matrix-Isolation Raman Spectroscopy. High-Pressure Raman Spectroscopy. Surface-Enhanced Raman Spectroscopy. Raman Spectroelectrochemistry. Raman Microscopy. FT-Raman Spectroscopy. New Raman Imaging Spectrometry. Applications: Applications to Structural Chemistry. Applications to Biochemistry, Biology, and Medicine. Solid State Application. Industrial Applications. Appendices. Subject Index.